This week I’d like to introduce a friend of mine, Anne Wheeler. She’s the author of Forever’s End, an Asrian Skies short story and the upcoming novel Asrian Skies. Katryn Holt scarcely remembers what life at the research station on Iythea was like before the Haederans arrived—but she can’t forget what life is like now. Between the forced labor and nights spent dreaming of a home she’ll never see again, quick glimpses of her sometimes lover Kaz are the only bright spot. But now Kaz is dying, and the thing he wants most is the one thing Katryn can’t give him…freedom. I’m Anne, worker bee, mom to a three-year-old, and new indie author. I just self-published a short story, Forever’s End, and my novel Asrian Skies is set to be released this fall. Ha. When I was four, I memorized a half-dozen books and told everyone I could read (I couldn’t). I’m sure I badgered my parents into “just one more book” at bedtime well before then. This is too hard! I’d have to say Little House on the Prairie, since I went through four copies. It always amazed me that a girl my age could live so differently, yet not all that long ago. But the Nancy Drew books and anything by LM Montgomery got a lot of use as well. I still have boxes upon boxes of those stashed in a closet somewhere. The Lion, the Witch, and the Wardrobe. It didn’t change me as a person, or even a reader, but as a writer, it made me realize there was a happy medium between Christianity and fantasy—that both could coexist within the same author, in the same book. It had a huge influence on me when I decided to write. I know what you mean. It’s comforting to realize that Christianity and fantasy aren’t mutually exclusive. The last book was Hugh Howley’s Molly Fyde and the Parsona Rescue. Someone on Twitter recommended it, and I’d never have picked it up on my own, but I enjoyed it. I recently discovered Lois McMaster Bujold, so I’d say one of her books is a current favorite—either Memory or The Hallowed Hunt. Yep, I have eclectic taste in books! I’ll be unoriginal and say CS Lewis. I’ve never enjoyed an author’s non-fiction books outside of his. Only about a year ago, during my husband’s last deployment. I had a lot of free time and bits of a story were stuck in my head. As soon as I let myself write it down, it just appeared on paper. Writing has been a huge wakeup call about my low self-confidence. It’s really hard to take constructive criticism and not feel like you’re falling apart or that your work isn’t the worst thing ever written. That’s something I’m still working on, and I dread the first one star review of Forever’s End. On the plus side, it’s been an introduction to two new worlds—the one I created in my head, and the amazingly supportive community of writers across the world. Every writer goes through this exact struggle. You’re definitely not alone. Trust in your own process. That’s really difficult (see above), but as a writer who has trouble following the “writing rules”, it’s the advice that really sticks with me. We all have different ways of writing, but as long as projects get finished, I don’t think there’s really a wrong process. Asrian Skies is about a fighter pilot princess who becomes a spy. That sounds a lot crazier than it is, really. It’s just about to head off to the editor, so I’ll get to focus on its sequel, which in the grand tradition of second novels, is giving me a whole lot of trouble. I also have a few short stories set in the same world that are in various stages of drafting and revising. One is so self-indulgent I may never release it, but you never know! I’m a lapsed flight instructor. I keep telling myself I’ll get back into it one day, but let’s face it, my students always wanted to kill me, and writing is safer (and more fun, but don’t tell my pilot friends). I also hike and try to take at least one trip a year to do some solo exploring—this year is the mountains around Tucson. Coincidentally, that was last year’s trip as well. Even more coincidentally, part of Asrian Skies involves my characters tromping through the mountains. ANYTHING. No, really, I’d settle for being an expert in anything. I’m the definition of a dilettante. Japan! I’ve been there a dozen times on business, and I’d love to go back and spend time outside of work really getting to know the people and culture. Facebook is the best way. I really appreciate the opportunity…and it’s been enjoyable! Thanks for being on the blog. I can’t wait to get a peek at Asrian Skies! If you’d like to read more, you can find her books on Amazon. And be sure to keep an eye out for Asrian Skies, coming this fall. 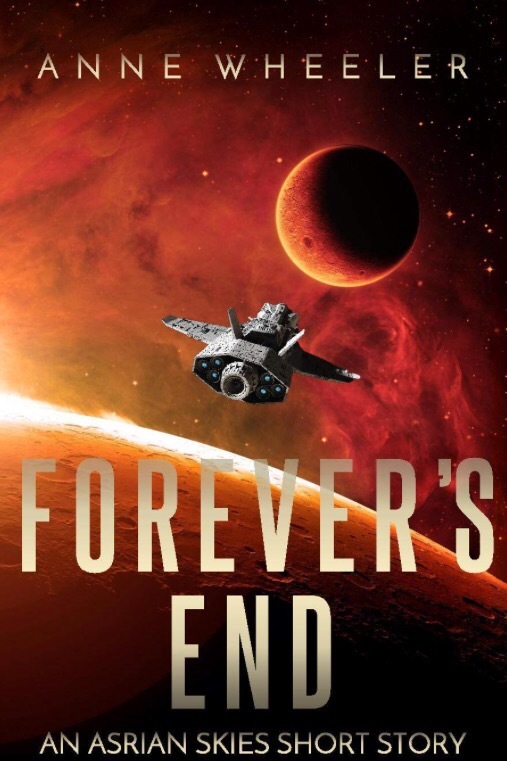 If you haven’t read Forever’s End yet, it’s a great appetizer before the novel.